After giving their lives to contributing to society, raising families and eking out a living, many senior citizens find that old age becomes a burden they have to contend with. Most younger people take an unsympathetic view to getting older, forgetting perchance that one day it will be their turn too. Retirement without a social life and activities to keep the brain cells in motion can be debilitating because it brings on depression and exacerbates pre-existing medical conditions. 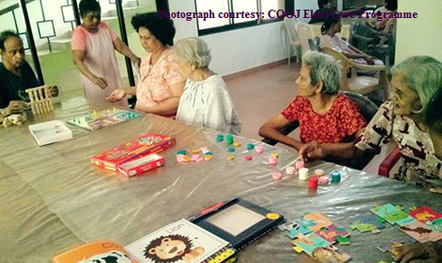 Senior Citizens in Goa can, however, hope for happier golden years in the relatively new move of COOJ (Cause of Our Joy), an NGO that rehabilitates individuals afflicted with mental illness. The ElderCare Programme started by the NGO has already made a positive impact on the lives of the inmates of old age homes in Aldona, Ucassaim and Giri. Aarti Sinha moved from Mumbai to Goa three years ago. She has the experience of working as a music therapist helping people with special needs in Mumbai. ‘I was working in a similar organisation in Mumbai as well… which was again a day care-rehab centre for people with mental illness,’ says Aarti, reflecting on her work at COOJ. Aarti, who has trained in Music Therapy from Mumbai Educational Trust and has a background in psychology and Indian classical music, initially began as a music therapist, but as time went by she decided she wanted to increase her role at the centre. This dovetailed with Dr Peter Castelino’s (co-founder of COOJ) suggestion that something needs to be done for the elderly in Goa, an area that receives little or no attention compared with causes connected with the underprivileged and children. The ElderCare Programme, which began two years ago, covers an eight month period wherein Aarti goes into homes twice a week and conducts recreational as well as therapeutic activities which would involve music, movement, etc. All activities are modified according to the cognitive and physical capacities of the inmates of the old age homes. The staff and volunteers are trained as they observe the motions of the programme, and at the 6th month the responsibility is eased onto the shoulders of the staff and volunteers. Aarti keeps a watchful eye to evaluate their progress and determine if they are capable of continuing with the programme on their own. COOJ does not charge the old age homes for the programme which continues on the NGO’s own funds and donations from people. Aarti gives the example of the old age home at Giri which primarily constitutes women. There are about three or four inmates confined to wheelchairs and a few others whose cognitive skills have diminished. The process begins with the inmates sitting in a circle and exercising. Of course, the wheelchair bound inmates have special exercises they can do on the wheelchair. They have cognitive games which once again depend on the inmates’ level of abilities. They play card games, housie, putting together simple jigsaw puzzles, and segregating poker chips according to their colour. Because the games require them to interact, the once socially isolated inmates are encouraged to speak to one another and thus social interaction increases. This communication is significant by itself as it keeps them cheerful and happy, while the games and exercises stimulate cognitive and physical agility. ‘Building a rapport with the inmates is the hardest part, especially when it comes to getting them to participate. But once they get involved, they begin to look forward to the days that we go to the homes,’ says Aarti. Aside from the programme, there are festive events held to entertain the old folks. The Golden Stage has become an annual event that is held in January since 2015. This year there were about 300 seniors from old age homes as well as the community. It was a carnival themed function that the senior citizens greatly enjoyed. COOJ has also taken up celebrating Daan Utsav (Joy of Giving Week), an event that is held in the first week of October all over India. Since all expenses are met by way of donations, be it money, snacks, venue, transport, etc, the cost is nil. ‘Everybody comes from the homes we’ve worked with because they know what to expect from us,’ says Aarti. With the increased life expectancy, there is an increased number of older people in our population. The younger generations are often not emotionally or practically able to deal with the situation. Aarti believes that these days moving to old age homes has its plus points. She says, ‘Old age homes are well maintained in Goa, from what I have seen. The inmates get their food and medicines on time and they have people of a similar age with them.’ As the mindset of people changes, more older people prefer their independence and assisted living homes as found in the West and in European countries may become commonplace. For now, nevertheless, COOJ has taken on the mantle to inject vim and vigour into these old souls and make their golden years truly joyful.